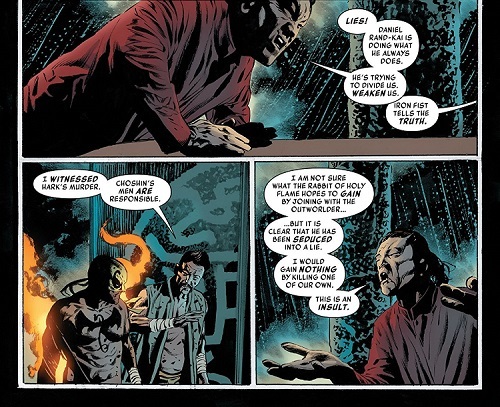 The fifth issue of Ed Brisson’s Iron Fist brings about the conclusion to the Trial of the Seven Masters. The work also roots itself heavily into Matt Fraction and Ed Brubaker’s Immortal Iron Fist series. We learn a bit more about the exile of citizens from K’un-Lun and how it relates to Daniel’s current predicament. All in all, Iron Fist have firmly grounded their history in one of the character’s most iconic runs, but Brisson is by no mean content to live in the past, instead pushing the lore forward in new and magnificent ways. 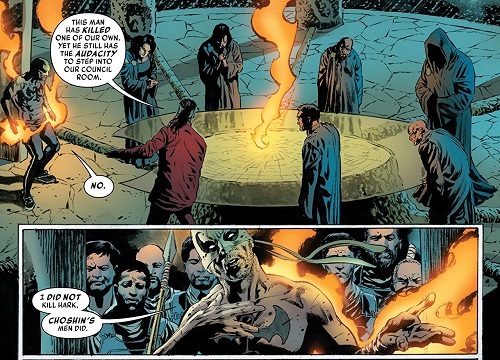 Plot: After being framed for murder following a series of grueling battles in the Trial of the Seven Masters Iron Fist heads to the council room at Liu-Shi. Upon arrival he immediately accuses Choshin of murdering Hark and luring him to the island to steal the power of Iron Fist. As the council was struggling with a classic case of “he said-he said,” the Rabbit of Holy Flame, one of Daniel’s opponents in this farcical competition, stepped forward to corroborate Daniel’s claim that the murder was, in fact, carried out by Choshin and his men. Declaring himself through with their shenanigans, Iron Fist decrees the competition over. At that same time, a shadowy being steps forth and tells Danny the competition is only over once he passes the final test. The final test just so happens to be the shadowy figure, now known as The Wolf. Over the course of their fight, during which Iron Fist takes the most punishment, it is revealed that The Wolf is actually The One; the final challenge for anyone seeking to finish their quest of becoming the Iron Fist. 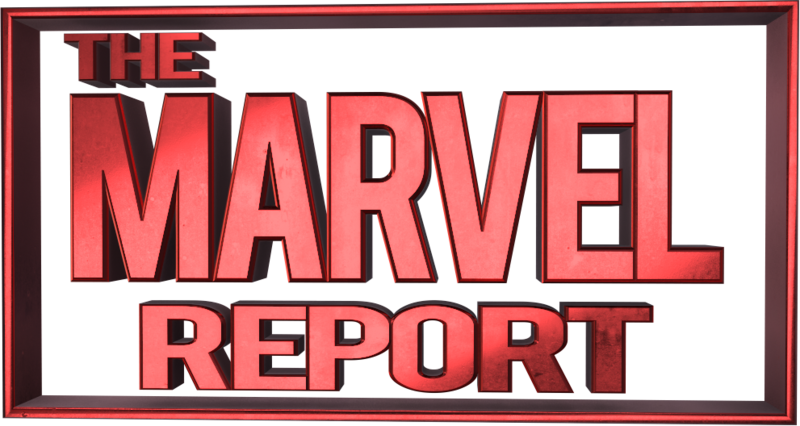 Daniel wins the battle after some deceptive meddling, Hark’s true killers are arrested, and the previous challengers all offer Danny a bit of wisdom as he searches out the truth, the future of K’un-Lun, and the teachings within the Book of the Iron Fist. 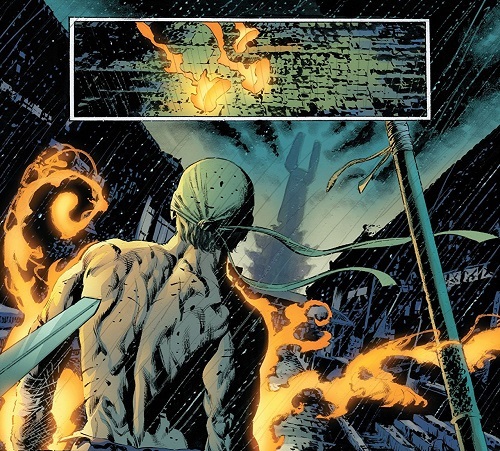 Story: Brisson has done a fantastic job with Iron Fist. He’s made no secret of the fact that Immortal Iron Fist will feature heavily in new storylines. The Trial of the Seven Masters was very reminiscent of The Seven Capital Cities of Heaven. Fight scenes served both form and function, often filling in the blanks for the reader during them. By using combat conversation, Brisson was able to give the reader a rather formidable backstory to the current tournament. The corruption of Yu-Ti thoroughly destroyed the lives of Liu-Shi’s residents. They were among those unfairly and forcibly removed from K’un-Lun, though many still care a great deal about the heavenly city. 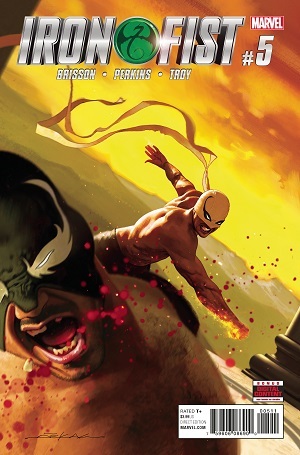 At the heart of this Iron Fist arc was Brisson honoring the tradition of the Iron Fist, updating those traditions and giving the reader an unspoken promise that this iteration of Iron Fist will be fun, action-packed, filled with historical material, and written in a manner that does the series justice. As the arc came to a conclusion, Danny confided in his new Liu-Shi allies that K’un-Lun was not in a good place. They insinuated to Danny that all he needed to do was ask and they would help him restore K’un-Lun to its former glory. It was a metaphor rooted in an allegory that K’un-Lun and the Iron Fist, as a series, are ready to return to the heights of years past. Art: Mike Perkins and Andy Troy truly go upward, onward, higher, higher with each Iron Fist book. The art in the fifth book was the literal definition of saving your best for last. The art has never been a problem area for Iron Fist, but the great ones continuously outdo themselves. This final book took all of the lessons the art team learned from the previous four and packaged them with a bow for the conclusion. As mentioned earlier, one of the things that the better Iron Fist writers do is find a way to reveal content through action or fighting, but it never comes at the expense of a thrilling and engaging fight. The two seem to share a symbiotic relationship, with both parties somehow getting the best of the deal. This was done especially well during Rand-Kai’s battle with The Wolf. As the two fight, the commentary is built around dazzling effects of fire and power. Martial art matches show every drop of blood spilled in the name of honor, integrity, and the very soul of K’un-Lun. The anger and years of resentment toward the corrupt leaders of K’un-Lun can be seen on the expressions of those who would see Danny beaten to death. The entire arc was a visual treat and, above all else, it featured some really wonderfully drawn dragons.